Nothing quite like a plate stacked with fluffy clouds of happiness and a cup of coffee to start off the day, especially after you've finally perfected it and your kitchen looks as if it's just been flour bombed! With pancake day knocking on our door and trying and at times failing,at being a topnotch domestic goddess, by not making my own pancakes and buying readymix batter and then tying to pass it off as my own and then getting caught out. I decided this year I'd make a batch of actually homemade fluffy pancakes and loaded with a few of our favourite fruits. 1. No time for messing around, we've hungry bellies to feed! So whip up all ingredients in a bowl to make your pancake batter. 2. Heat your frying pan over a medium high heat and add a knob of butter. Once melted grab your ladle or spoon and pour in your batter in to your pan. 3. Great trick to know when your homemade fluffy pancakes are ready on one side, is when they start to bubble up that's when you know they are ready to be flipped. 4. Pile up high, you should get around 12-16 fluffy crack pancakes depending on size. 5. If you have children or young siblings this is when they come in handy, decoration time! Let them go crazy and have some fun in creating the perfect pancake. Super easy to whip up they honestly take no time at all, and I'm certainly happy to put down the ready made batter mix this year and enjoy my homemade fluffy pancakes. What will you be topping your pancakes with? OMG these look AMAZING. Am totally gonna have a go myself - I might make them a bit more clean eating style though. This looks so delicious! I need to try it! My daughter will love these. Oooooh delicious. Pancakes should be for more than just pancake day being this easy to make! I always make American Style with buttermilk. They're yummy! OH my GOSH. These looks delicious. I am going to try them out tonight. Who says pancakes are only for breakfast?!? These look lovely! I'm going to make pancakes tomorrow! I've never been great at making pancakes but this look like an easy proof recipe! Yummy! 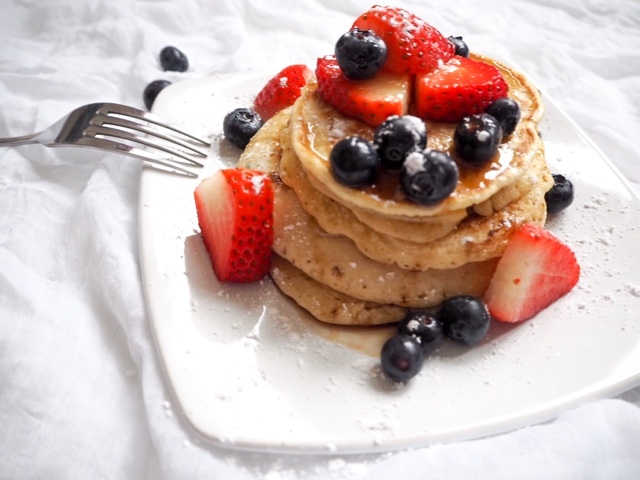 Pancakes are my favourite things ever! Technically for pancake day, I prefer the crepe style pancakes but the other 364 days of the year I'm with you on these big fluffy ones!! bookmarked and easy to come back to tomorrow! Thanks for the reminder about preparing in advance that'll save so much stress at teatime. Breakfast food is a weakness that I don't want to overcome! This looks really good. I prefer homemade pancakes than the instant mixes in groceries! Oh i love having pancakes in my breakfast! This is yummy! Wow this homemade pancakes look very tasty. Making me very hungry now. Lol. I prepared my batter last night using no animal ingredients :) I'm looking forward to cooking them tonight and smothering with fruits and biscott spread. Yum. God, they look amazing! I can't wait to make pancakes later today. I like them quite simple too but the maple syrup and fruit looks so good. These look good - Although I am known for covering them in Nutella so you can't even see the pancake. The more the better! I've been looking for a fantastic pancake recipe all day and I've just found it. Thanks for this -I'm off to make some for our dinner now! Wow these look amazing! 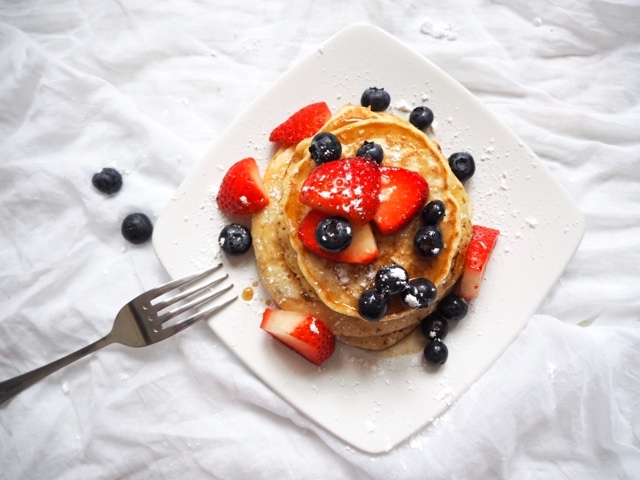 Pancakes with fresh berries for breakfast it what dreams are made of! Happy Belated Pancake Day! I had cheese and ham on my first then lemon and sugar to finish! I even had a few left over this morning! Will try this recipe. Looks deliocious! They look so delicious, especially topped with all the fruit. I'd love some of these for breakfast!